This cherry-sized little bundle of pink greatness, with white flesh, happens to be my favourite and most attractive vegetable. First cultivated in China, radishes are popular in Asian cooking; early records show that in ancient Egypt people were paid in radishes while working on the construction of the great Pyramids. Peppery, crisp and crunchy in texture, radishes are found in so many varieties, shapes and sizes. Radishes are great snack item, very low in kilojoules, containing vitamin C, folic acid and iron. The popular and readily available red globe radish has high water content (95%). This means that it can increase hydration levels. Radishes are also perfect to keep your breath fresh! Choosing the best radishes are important. 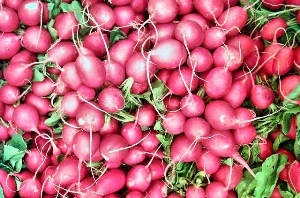 When buying a fresh bunch, the radishes should be firm to the touch and maintain a bright pink colour. Extremely versatile in the kitchen, radishes are often eaten raw but they can be prepared in various other ways like roasting, pickling or sautéing. Naturally you would want to keep its beautiful red skin to add colour to any dish. Dress with lemon juice, salt and pepper to increase the flavour profile. With the included recipe, with variations and alternatives, the radish is truly a vegetable to be loved and thoroughly enjoyed. 1. 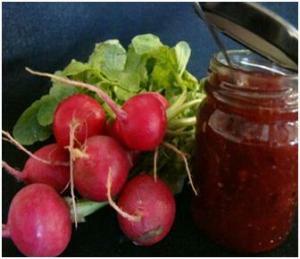 Grate the radishes on the fine side of the grater, to give the chutney a bright red vibrant colour – do not peel. 2. Combine all ingredients, except the honey, in a saucepan. Allow to simmer until the sugar has dissolved and the mixture thickens. 3. Add the honey and stir. 4. Spoon into a bottle and serve when needed. As simple as this chutney is, you can spice it up as you please. An addition of diced celery or onions, as well as grated fresh ginger will go with it just as well. Radish chutney can be served as a delicious accompaniment; include it in your cheese board, as a condiment, with specialty breads and an array of appetizers.